An affordable way to personalize your wedding reception from cocktails to dinner and dessert tables. 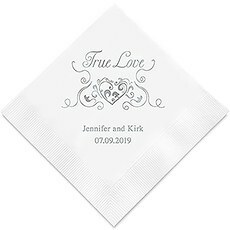 If ever there was an occasion for personalized napkins, a wedding would definitely be it. 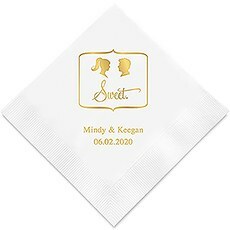 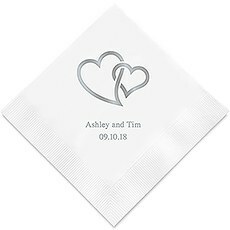 From cocktails to dinner and candy tables, our Personalized Wedding Napkins are an affordable way to make your nuptials uniquely yours. Our extensive assortment of napkin designs runs the gamut from whimsical to romantic to classic Mr. and Mrs. napkins. 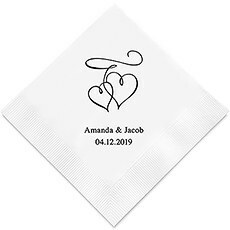 Are you hunting for budget wedding napkins and trying to stay within your means, yet you still want a personal touch for your wedding décor? 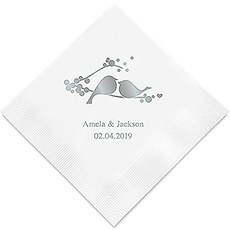 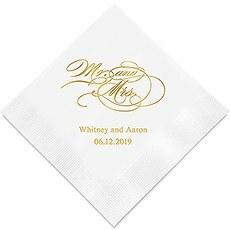 Our goal is to provide you with an affordable, stylish way to capture the theme of your wedding through your napkins and make the event uniquely yours. 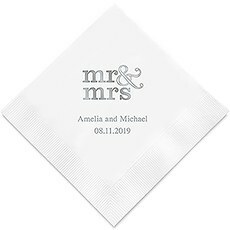 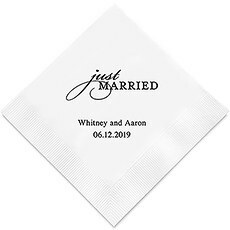 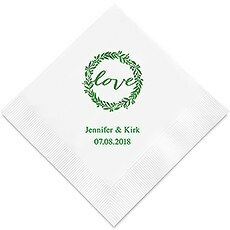 With so many options available, finding the wedding logo napkins that coordinate with your color scheme and capture the theme of your special day is simple. 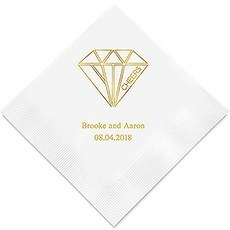 From two pears with the caption, "The Perfect Pair," to napkins with love birds, geometric diamond prints, toasting champagne flutes and lots more, we have every design imaginable. 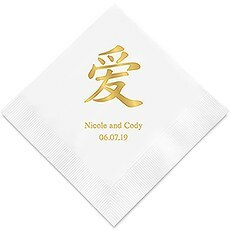 Do you fancy the traditional "Just Married" or do you prefer something more unusual, such as the Asian symbol for love or the clever "Eat, Drink, Marry"? 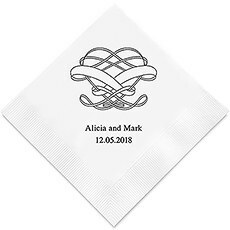 Once you find your favorite wedding logo or saying, you can go a step further and have each napkin customized with names and a date. Get creative and have a favorite saying or nickname added too. 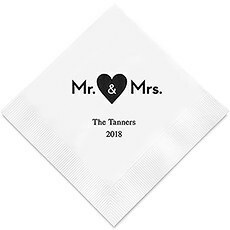 You're also in the designer's seat when it comes to choosing the background color of the napkin as well as the font color. 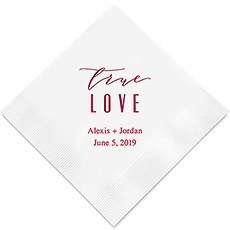 Our rainbow-like assortment of hues ranges from classic white to coral to wine. 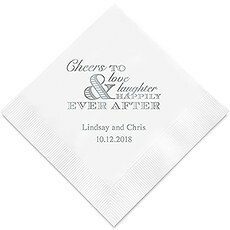 Whether you pair these napkins with appetizers, cocktails, dinner or all of the above, your guests are sure to appreciate your attention to detail. 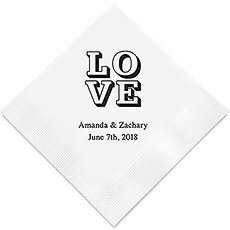 While these napkins are a stylish choice for a wedding reception, they most certainly can be used to celebrate other wedding festivities such as engagement parties, bridal showers, bachelorette parties and rehearsal dinners. 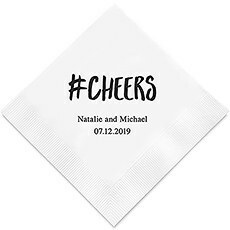 Choose from a wide range of designs, including a bright red kiss for a bachelorette party, a bride and groom logo for an engagement party or the "#Cheers," which is just right for a modern, internet savvy couple at their rehearsal dinner or wedding reception. 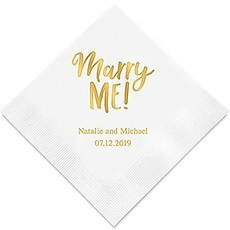 These high-quality, three-ply napkins area available in three sizes — cocktail, luncheon and dinner – and at such a competitive price point, they are a stylish way to accent your celebration without going over budget. 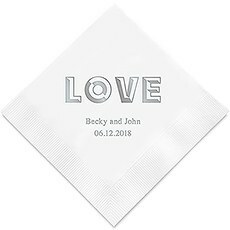 Our customized wedding designer napkins prove that it's the little things that have the biggest impact.